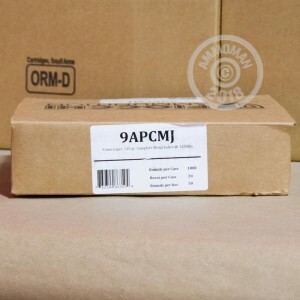 This is Fiocchi's 9mm Complete Metal Jacket, or CMJ, ammunition. 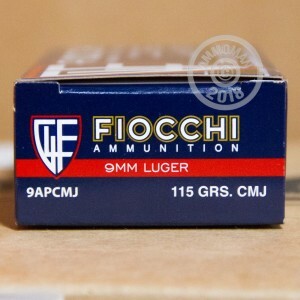 Fiocchi's CMJ line features a copper-plated bullet that completely encloses the lead core. 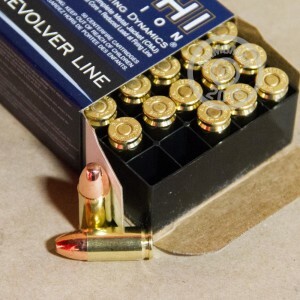 Because of the complete casing, these cartridges are great for indoor range shooting. The 9mm is one of the most popular and widely used handgun cartridges because of it's flat trajectory and moderate recoil. These rounds are loaded with a standard, 115 grain bullet and are non-corrosive and uses new production boxer-primed brass cases. Fiocchi is family-owned and has been in business for over 130 years. They pride themselves on producing a quality product and have received several awards because of this concentration. Great ammo, no jams out of my 19 and clean, it does not disappoint.